Fill your home with fresh spring breezes with ventilating casement windows from Renewal by Andersen of St. Louis. These slender, user-friendly windows can be opened wide to let in much needed ventilation, making them perfect for rooms like the kitchen or bathroom. Renewal by Andersen casement windows feature a maximized glass surface area for a brighter home and a better look at the great outdoors. The High Performance Low-E4 glass that makes up this surface area is surrounded by a durable, energy efficient Fibrex material frame, which can be customized for both interior and exterior aesthetics. With the simple turn of a h and crank, your casement windows can either be opened to the freshness of the outdoors or sealed tight against even the harshest weather. Renewal by Andersen casement windows are made weatherproof by a special sealant, which the window installation experts at Renewal by Andersen of St. Louis will apply during our installation. Once applied, the sealant will stop the penetration of high winds, rain, snow, and other elements that tend to break down less durable wood, vinyl, or aluminum casement windows. 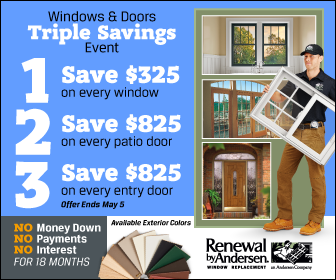 As with each of the window styles we install here at Renewal by Andersen of St. Louis, our casement windows are backed by an industry-leading warranty thanks to our status as the exclusive Renewal by Andersen retailer in St. Louis. See the Renewal by Andersen 20/2/10 limited warranty for details. To learn more about our casement windows, give us a call or fill out our Request an Estimate form to schedule a FREE in-home consultation with the leading experts on replacement windows in St. Louis- Renewal by Andersen of St. Louis.